Martin Luther King Jr. Day is Monday, January 16. Many of us will honor his memory by participating in a day of service to the community and by attending special programming that highlights the important issues that Dr. King fought and died for, such as social justice (see the announcement for a JSPAN sponsored program below). 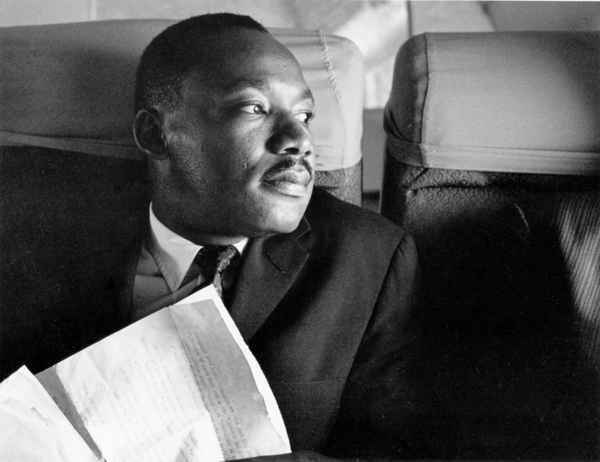 On Friday evening, April 5, 1968, the day after Martin Luther King’s assassination in Memphis Tennessee, Rabbi James A. Wax of Temple Israel, president of the Memphis Ministers’ Association, delivered an impassioned sermon, eulogizing Dr. King, and placed his teachings in the arc of Jewish and Christian tradition and denounced the shame of white Memphis and America. Below is an excerpt from the sermon and a link to the full text. –Ed. “What did Martin Luther King do? Martin Luther King helped to bring freedom to the oppressed people yet in this free nation. He fought to break the chains that have oppressed people; he sought to give men dignity; he sought to make this a better world in which to live. Oh how the cynics sneered when they gave him the Nobel Peace Prize. They said, ‘what did he do to deserve it?’ How little can people be? Here was a man in the tradition, the grandest traditions of Judaism and Christianity, bringing freedom to people, and we white hypocrites that speak about freedom for all people know full well that not many miles from here negroes could not vote. In this very city, called a place of good abode, because their skin was black, they had to sit in the back of the streetcar. They were not even given the dignity of their names. Moderating the discussion is Mr. E. Steven Collins, Director of Urban Marketing and External Relations, and the host of Philly Speaks at Radio One. Dr. John Noakes, Associate Provost of Academic Improvement and Interim Dean of Graduate Studies at Arcadia University and Associate Professor of Sociology and Criminal Justice, who is an expert on the relationship between the state and political dissent. Mr. Marc Bookman, Executive Director of the Atlantic Center for Capital Representation, a non-profit death penalty resource center located in Philadelphia, Pennsylvania. ACCR provides pre-trial consultation to capital defense practitioners and defense teams in Pennsylvania and Delaware. WASHINGTON — Several members of the Supreme Court appeared frustrated on Monday as they surveyed the available options and looming deadlines in a major voting rights case from Texas that could help decide control of the House. The justices in essence must choose between two sets of electoral maps, or at least tell lower courts how to do so. The maps concern the two houses of the Texas Legislature and the House of Representatives. One set of maps was drawn by the Legislature, which is controlled by Republicans. Those maps seem to favor Republican candidates. The other set was drawn by a special three-judge federal court in San Antonio, and it increases the voting power of Hispanic voters and seems to help Democratic candidates. As many as four House seats hang in the balance, experts in election administration say. The legal question for the justices was how to treat maps drawn by legislatures in states with a history of discrimination. Pennsylvania plans to make the amount of food stamps that people receive contingent on the assets they possess - an unexpected move that bucks national trends and places the commonwealth among a minority of states. Specifically, the Department of Public Welfare said that as of May 1, people under 60 with more than $2,000 in savings and other assets would no longer be eligible for food stamps. For people over 60, the limit would be $3,250. Houses and retirement benefits would be exempt from being counted as assets. If a person owns a car, that vehicle also would also be exempt, but any additional vehicle worth more than $4,650 would be considered a countable asset. Anne Bale, a spokeswoman for DPW, said the asset test was a way to ensure that "people with resources are not taking advantage of the food-stamp program," funded by federal money. Critics of the DPW plan say it would particularly punish elderly people saving for their burials, poor people trying to save enough money to get out of poverty, and working- and middle-class people who lost their jobs in the recession and may now have to liquidate assets to feed their families. "If conservatives want people to be less dependent on government, and reward work and entrepreneurship, then you have to allow low-income people to have a little bit of money in the bank," said Joel Berg, a national hunger expert. In 2010, the Chicago Public Schools declined to hire Darrell Langdon for a job as a boiler-room engineer, because he had been convicted of possessing a half-gram of cocaine in 1985, a felony for which he received probation. It didn’t matter that Mr. Langdon, a single parent of two sons, had been clean since 1988 and hadn’t run into further trouble with the law. Only after The Chicago Tribune wrote about his case did the school system reverse its decision and offer him the job. A stunning number of young people are arrested for crimes in this country, and those crimes can haunt them for the rest of their lives. In 1967, President Lyndon B. Johnson’s Crime Commission found that about half of American males could expect to be arrested for a nontraffic offense some time in their lives, mostly in their late teens and early 20s. An article just published in the journal Pediatrics shows how the arrest rate has grown — by age 23, 30 percent of Americans have been arrested, compared with 22 percent in 1967. The increase reflects in part the considerable growth in arrests for drug offenses and domestic violence. PA Senate Bill 1220, versions of which have stalled for years, will likely be brought to a floor vote in early 2012. It would add low-level nonviolent misdemeanor convictions, such as shoplifting, check fraud, and possession of small amounts of marijuana, to the types of offenses that can be expunged from criminal records under certain conditions. If passed, it would move to the House. –Ed. JSPAN filed a brief in a case involving the same immigration issue, which, the Supreme Court ultimately declined to hear – Ed. AMERICA’S HALF-BAKED immigration system is riddled with unfair, arbitrary and inhumane provisions, but few are so senseless and cruel as those covering the undocumented immigrant spouses and children of U.S. citizens. Now the Obama administration is proposing a prudent rule change that would prevent thousands of pointless family separations and prompt untold numbers of illegal immigrants to seek legal status through lawful channels. Currently, undocumented spouses and children of American citizens are eligible for green cards if they return to their native countries to apply for U.S. visas. But when they do, they are automatically barred from reentering the United States for up to 10 years — the penalty for having been unlawfully present here. The way around those harsh measures is to prove that family separation would cause a U.S. citizen “extreme hardship” — for instance, by depriving him of the family income or help with child care that the immigrant spouse provided. The catch is that while U.S. immigration authorities grant thousands of such waivers annually, the process takes six months on average, and sometimes much longer, stranding spouses and children far from their families. Given the long delays and possibility of rejection — and prolonged family separations — many never bother to apply. The rule change, proposed by the U.S. Bureau of Citizenship and Immigration Services, would allow such spouses and children to remain in this country while they seek provisional waivers. Nothing else would change: Once a waiver is granted, the immigrant would still be required to return to his home country to apply for a visa. But the shift would streamline the process and cut family separations to the days or weeks it takes to issue a visa, rather than the months required for a waiver application. On Wednesday of this week, all nine Justices on the Supreme Court, agreed that a Lutheran Church did not have to answer claims of employment discrimination brought by a former teacher in its school. Applying the “ministerial exemption,” the Court ruled that the teacher could not maintain her claim that she had been fired in violation of the Americans with Disabilities Act. The Court's interpretation of the ADA was grounded in the First Amendment, but the ruling expressed no view on whether the ministerial exception bars other types of suits, including actions by employees alleging breach of contract or tortious conduct by their religious employers. To read the Court’s decision in Hosanna-Tabor Evangelical Lutheran Church & School v. EEOC, click here. The Supreme Court will hear a case on Monday [January 9] in which a couple from Idaho claims the Environmental Protection Agency improperly ordered them to restore wetlands that EPA alleged they illegally destroyed near scenic Priest Lake. The couple, Mike and Chantell Sackett, say they never believed there were any wetlands on their property and had no reason to suspect they might need a Clean Water Act wetlands permit before building on the land. But a timeline of events prepared by Ms. Sackett herself clearly shows otherwise. More on that below. The Sacketts portray their lawsuit as a motherhood-and-apple-pie case of an ordinary family who just want to build their dream house. But how many Americans do you know whose home-building plans attract support from the American Petroleum Institute, the National Mining Association, National Association of Manufactures, and dozens of other corporate interests? These industry groups have filed friend-of-the-court briefs on behalf of the Sacketts because they see an opportunity to hamstring the EPA’s ability to enforce the Clean Water Act -- and potentially a whole raft of bedrock environmental laws that protect Americans’ health and natural resources, including the Clean Air Act, Safe Drinking Water Act, and the Superfund hazardous waste law. If the court rules in favor of the Sacketts and these industry giants, the agency will have a much harder time stopping environmental harm—things like dumping toxic chemicals into rivers, as well as burying wetlands and other sensitive areas. The Jewish Book Council just announced the 2011 National Jewish Award winners. Art Spiegelman won in the Biography, Autobiography, Memoir category for his book “MetaMaus: A Look Inside a Modern Classic, Maus.” Below are highlights from an interview of Spiegelman by NPR from last October – Ed. Maus blends the stories of Spiegelman’s trying relationship with his father and a horrifying tale of Auschwitz, as seen through his father's eyes. Spiegelman drew the Jews as mice and the Germans as cats. MetaMaus: A Look Inside a Modern Classic, Maus is the story behind Spiegelman’s signature work, complete with interviews, answers to many persistent questions and examples of his early drawings.